Sleep is number one; The most under rated habit of every human. 1. Optimal sleeping patterns are to be asleep in bed at 10pm and rising at 6am. This can take a little bit of getting used to so I recommend if struggling to get to sleep by ten, try to tweak backwards by 15 minutes every night from there. Bright lights are one of the key disruptors of getting quality rest in the lead up to sleeping so winding down in a dark room for even ten minutes free of bright lights from tvs, iPhones, laptops works wonders. I find a bath once a week to really aid with falling asleep, I use Pure Athlete Bath Salts or alternatively if I run out Epsom salts. Epsom salts are high in magnesium that absorbs through your skin which really helps with sleep quality. 2. Daily exercise. The level of exercise manageable is going to be different for everyone depending on lifestyle, work commitments etc . But for every single human exercise is vitally important for the body to function. Everything from just five minutes of breathing squats to the high level exercise that comes with a sport such as surfing etc. The main takeaway is that doing more exercise of any kind is going to have a positive impact on your quality of sleep. As humans we have been built to move daily, ignoring this can have negative consequences and really affect sleep quality. This can be a dangerous cycle as if not exercises leaves excess energy which then makes it more difficult to sleep, in turn leaves less energy for exercise. Breaking this cycle with energizing exercise is very important for optimal health. Coffee, Tea, red bull, sugar or any immediate energy booster comes at a cost and really affects sleep and can often be the reason for feeling drained in the morning. I would suggest ideally cutting out tea and coffee after Midday and chose a nice herbal tea like yogi or pucca. I find camomile great with assisting with high quality sleep. 4. Schedule morning in advance- as humans I believe we work so much better in groups. If you are struggling to get up in the morning schedule something for the next day in advance and make yourself accountable. So if I have a 630 am coaching call I'll naturally need to be up at 545. Unsurprisingly I’ll feel far more motivated to be up at that time to do my morning ritual, get well hydrated and be at my best for that coaching call. This makes me accountable so if I am feeling tired I haven't the option to sleep till 8 and then rush around to just about make it into work. Implementing these steps over the next few days will really help with becoming a morning person. How I have spent the last few days living my dream. I am currently traveling In Australia. I spent last Saturday training with the Reach Foundation in their HQ in Collingwood, I battled with a 36hour trip which was delayed by 8 hours in Amsterdam to just make it with one minute to spare. I was truly inspired by the amazing people I trained with. Thank you all. I caught up with my amazing friend and co founder of ( blend smoothie) Sunday morning. She is such a delight to be around and fabulous holistic health coach who is the prime example of living by example. I then met with Emeli Paulo Co Founder of Collective Potential, and subsequently attended her Workshop on Gratitude which was incredibly heart warming. I caught up with my Irish friends in St Kilda and couldn't resist getting out for some stand up paddle boarding. The guys at kite republic at the sea baths who looked after me great with their laid back approach and fantastic trust. I couldn't recommend highly enough to get down and give ago. I am heading to Brisbane now for a few days. I'll update again on the next leg of travels. 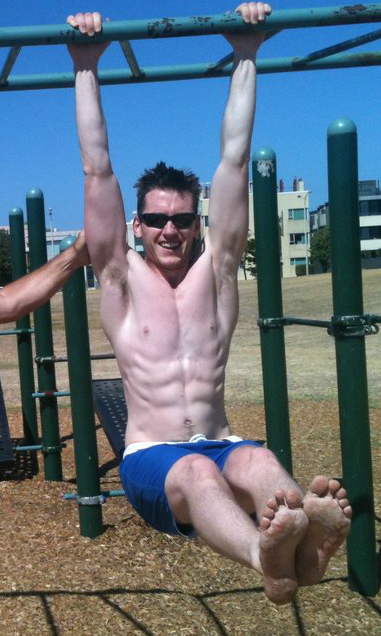 Training in the playground in Windsor, Melbourne. I got good laugh out of the way lighting can make you look insanely lean, I think this is the problem with seeing advertising and believing this is how you should look. This isn't how I look walking around. So the following day after a big night, more drinks than planned, whats the best way to get on track?! Get water into you as soon as possible. Even better, try sneak a few glasses in the night before going to bed, but the morning is an absolute must. To bring a bit of life back into my system I go for a quick dip in the sea. Exhilarating is an understatement to how fast this heals the body. The water in Ireland is freezing this time of year and jolts you back to life even faster. A lot of local health food stores offer different smoothies I usually go for one high in greens straight after the swim and it works wonders! I always get a gym session in after a late night, this works wonders in supporting the body by heating the vital organs and getting some life back into them. I normally go for a 60% recovery session (Give a quick example of what this is), and add in some extra sets. Pushing yourself too hard if you haven't hydrated enough can create a worse feeling so make sure to not go over board. If you really want to clear your system I recommend an apple cider vinegar bath with Pure Athlete bath salts. One cup of apple cider vinegar works wonders for detoxifying your skin. Recap; Plenty of water, dip in the sea, gym session, bath. I spent Sunday before last with a great friend of mine Orlagh. She is a real life hero and backs it up with her lifestyle. She works as a facilitator with the Soar Foundation and Barretstown House. Orlagh's work with Soar involves facilitating workshops in schools countrywide allowing for safe spaces for students to be there true selves. I am lucky enough to see the work Soar are doing and can honestly say their work is saving life's throughout the country. Well done Orlagh! 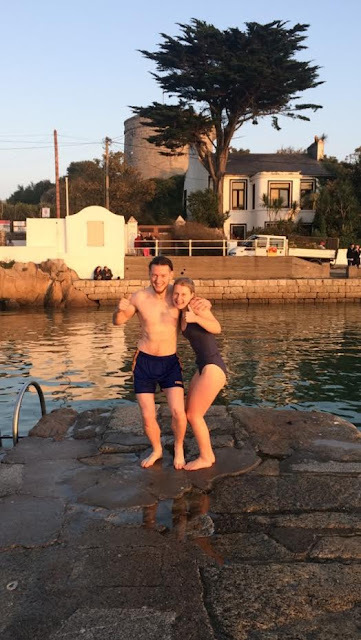 We caught up for a swim in Sandycove as the sun set last Sunday. Orlagh isn't used to the Irish water as she was recently abroad and got quite a kick jumping into the Irish Sea. This made for a fantastic evening which we discussed many issues Ireland is facing at the moment, and it was great to absorb it all. Here you can see me and Orlagh Posing. The benefits of swimming in the sea year round are many, energising and couldn't imagine keeping up with my busy lifestyle without it and maintaining health...and it's free! 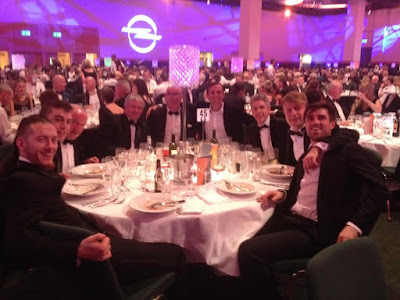 I attended the GAA/GPA All star presentations last Friday. I was invited by the Soar Foundation and had a great time. Even better on the night my younger brother got a last minute ticket and joined the celebrations. Myself, Cillain Brennan, Tony Regan, Pat Cusack, Karl Swan, Tony Griffin, Mark O Donnell, Michael aka Mitch, Ronon Conway. Big up to Philly McMahon for taking the photo. It was this night out that gave insight to the content above. I am heading to Australia shortly and look forward to some new experiences. I play GAA - hurling in particular. I love it, and I see first hand the sacrifice that goes in from players and management throughout a season. In Dublin our season tends to peak in Autumn - September and October are the months when the big games are played, the trophies are given out. Teams train for that - wanting to have everybody as physically prepared as possible for those championship games. Every little detail is covered by management, the game is mapped out. And then, as always happens, the week of the big game two or three of your important players come down with colds, infections. They end up playing the game, but at nothing more than 60%. This happens across the board - at every level. Who is responsible? Well - could have been the player himself not getting proper sleep. Could have been the fitness coach pushing the player too hard or not hard enough. Maybe it was the manager insisting on giving his talk in the pouring rain. Or even the teacher in the group dealing with snotty nose kids all day infecting everyone via the water bottles. Can we prevent this? We probably can. 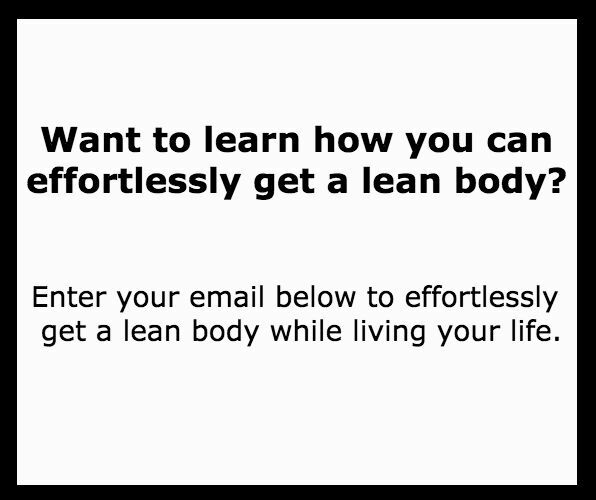 The question I’m going to try answer here is how do you make yourself bulletproof? This isn’t the time of year to be changing up your diet and trying to figure out the ratio of fat/protein really works best for you. What you’ve been eating so far has brought you here so lets not risk changing now. Depending on the individual, snacks may work for or against, but the three stables will build the the foundations. Tips? Eat good quality meat, fat and vegetables at every meal. I spoke in depth with Donal Carr about this - see here. - Good quality water is key. How much? When? And where to source it? How much? In kg’s .033 in litres of body weight. So at 82kg I need to drink(82x0.033) 2.7 litres on an non exercise day. So in reality closer to 3.7l depending on exercise and intensity of strength work will allow me to stay hydrated. First thing in the morning I’ll drink about half a litre - I normally put some lemon juice or apple cider vinegar in this. You don't want to drink too much before a meal, it can dilute your stomach acid, so I leave thirty minute gap before eating, then during the meal I really focus on chewing my food so I won't ever drink more than two or three very small mouthfuls with food. I then leave another thirty minutes or sometimes more depending on the size of the meal before drinking more water. Then I’ll drink water while working, I have a two litre bottle beside me such that I can then track how much or how little I drinking. I will do the same for lunch and dinner. Now this is where things get interesting. At training my club insisted that instead of having someone filling water bottles and sharing bottles, you simply bring your own bottle. This is ingenious, it literally took two training sessions for the guys along with remembering to bring boots and a helmet, had a bottle of water. At this time of year you don’t want to risk players forgetting to bring bottles and getting very dehydrated during sessions, so I’d suggest small sized disposable bottles so there is no sharing of bottles. Sleep is when you recover, for the average person 10:30pm until 6:30am is the natural sleep pattern, but as a high-performance athlete you need more. Adding an extra hour by sleeping 10pm until 7am will give your body optimal chance to recover effectively between sessions. Stay out of bright lights one hour before sleeping, this includes iPhones, TV & laptops. Candle light and fire-place are perfect. Drinking coffee or caffeine based drinks (including tea) after midday will affect your sleep quality. If you need that morning kick I would ask why, rather than adding an extra espresso. Stress is the mother of all disruption in the body. It’s as important to be aware of the stresses in your life as it is to even attend training, so working night shifts, fighting with your girlfriend, working overtime all add up. Seek to reduce stress especially during this time of year. Keep a journal. When you lift that county title or that All Ireland you can look back and repeat the following year continuously looking for that one percent that will be the difference between two in a row or looking back thinking "If Only". When I look back to 2008 while playing in Waterford IT I used to wear a hat and scarf to training and games, then as soon as I went without them a head cold with kick in. That all changed when I cleaned up my food intake, hydration and regularly swam in the sea. If only I had known that then! I met Pat Divily of Pat Divily Fitness based in Galway & Greg Muller of Pure Athlete also in Galway, two absolute gentlemen and what a pleasure it was to be in their company at the CHEK Inspire Conference. I arranged to meet my hurling physical prep coach and great friend Robbie Bourke, it's always a pleasure to spend time with him yet his demand has increased so much of late it is tough. I was blown away with Paul's lecturing capacity to turn it on and deliver in such detail. If you haven't heard of Paul, his book How to Eat, Move and be Healthy is a must read for everyone. 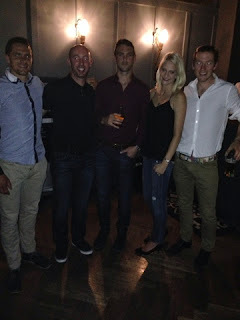 Image from left to right, Robbie Bourke, Greg Muller, Paul Chek, myself and Pat Divily. I am in the UK for the CHEK Europe conference in Surrey. I am very excited to meet the main man himself Paul Chek and even more psyched to be attending with my pal Robbie Bourke. 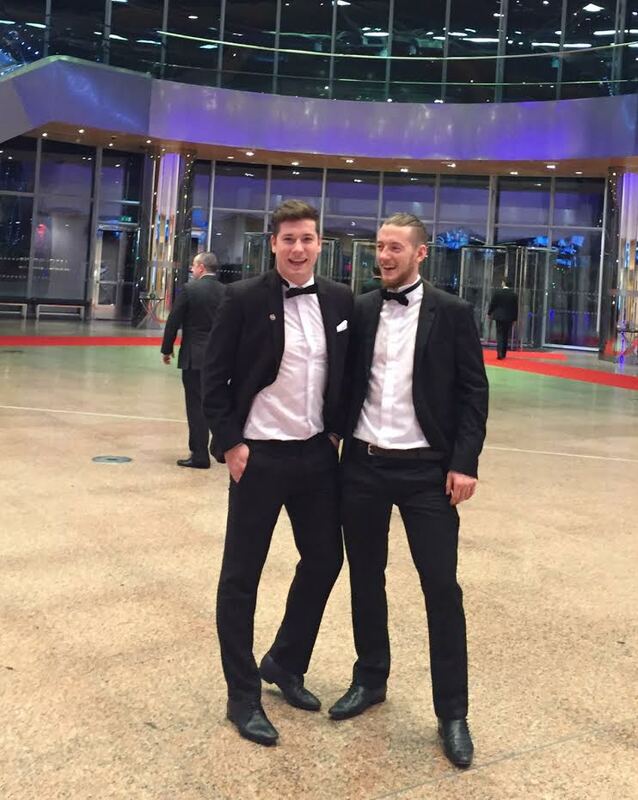 Myself and Robbie met while playing hurling with our local GAA club which we still part take to this day. Its very close to the twenty year mark when we started out. Robbie has been a close mentor to me over the last few years and though we certainly don't agree on everything we do agree on most things. Robbie has interviewed fifty five experts in the field of strength and conditioning and wellness on his podcast channel which can be found here. 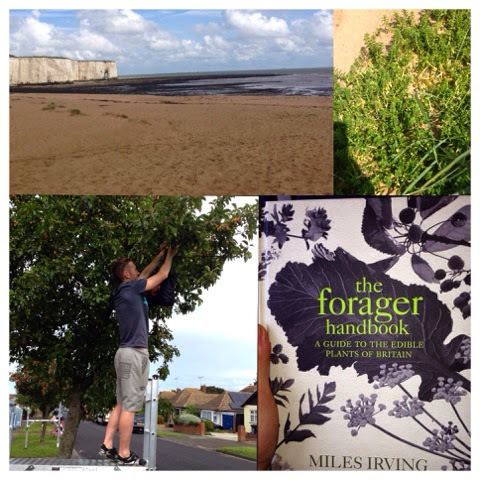 I spent the day foraging in Chartham with Miles Irving and WHOO do I feel super charged for the next two days. Miles is an incredible character that took me under his wing for the day. He are a few snaps I got while out foraging. "If you love life you breath that into other individuals"
Today in my blog I'll cover what I have been up to in the last week and how I spent time over the long weekend in Dublin. I spent Tuesday to Saturday in Baltinglass with the Teenhols charity with SVP. The purpose is to give deserving teenagers from disadvantaged areas of Tallaght and Crumlin etc, a holiday. 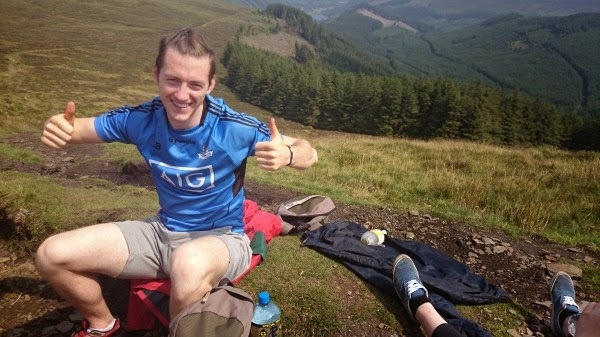 This was five days packed full of adventure in Wicklow & Kilkenny and we had amazing weather for the period. We rock climbed at the climbing walls in Baltinglass, canoed down the River Barrow finishing at the diving boards in Graignamanagh, horse rode going from trot to canter, swimming in the Slaney, hill walked across the Wicklow way (picture below- thanks for photo Linda) and much more; all the while trying to keep up with twenty four passionate teenagers. I had an amazing time and fully recommend volunteering with them. A friend and mentor of mine John Cantwell put this up a while back. It is a completely contrasting view to the conventional treatment of mental health. Very informative read I am sure you will enjoy. My friend Timmy Hammersly (centre) is off to walk the Camino de Santiago. 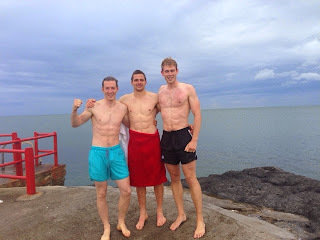 Before he flew off on Monday myself and Joe (all SOAR crew) thought there would be no better way to prepare than go for a dip in the sea at high tide in Portmarnock. Swimming in the sea is incredibly vitalizing and refreshing, and is something I fit in two to three times a week. I find my sleep quality to be much more in tune with natural circadian rhythms, which is why when traveling across time zones I prioritise sea-swimming before and after to beat jet lag as soon as possible. You can find more on the benefits of sea-swimming from my interview with Donal Carr Here. It's no surprise the following day at high tide I saw the great singer/songwriter Damien Dempsey out swimming too. During one of my first training workshops with SOAR we played Damien's 'Bustin' Outta here', which was recorded in my old boxing club in Glasnevin. I had five fights in the ring there and some of my proudest moments winning in front my father and friends. I haven't had the luxury of seeing Damien live, but with his upcoming gig in Portmarnock in late September that will have to change. Due to Timmy flying out from Dublin airport in the next few days, a couple of old team mates from Waterford IT got together for a night out. Here Timmy is on the left, with Brendan Kenny, Shane Fives, Jennifer and myself in Sams Bar on Dawson Street. People often ask me if I drink, and are somewhat surprised when I tell them I do. I balance alcohol with my metabolic type by eating higher protein and fat meals, hydrate well and swim in the sea before and after. I don't drink two days in a row as it doesn't give my body the chance to recover. I find it very important to eat large vital meals the following day and exercise. My favorite alcohol to consume is Bio-dynamic wine, but that's for another blog post! This gave me a feel for what wild meats feel like in the flesh, and more importantly while cooking. So how did I cook them? Well firstly I enlisted the help of renowned chef Maryanne Reddin. Her steady hand, and the top quality deer meant we were onto a winner. From scratch I made a batch of thick juicy succulent burgers, after mincing we put them straight onto the pan. We cooked medium rare - and I was surprised by how the burgers held their shape on the pan, and how attractive the meat was to eat uncooked in the middle. A tasty flavor came out which we used to make a sauce, adding some butter in the process. Comparing this beef to the beef I had been getting in Ireland is interesting - the beef I ate previously had a watery residue which would seep out, and really meant the attraction to have rare just wasn't there. It just didn't seem right so you instinctively cooked for longer. Some time later while in Melbourne I came across T.O.M.S organic butcher in the South Melbourne market. He said the meat was completely rared on organic grass, and more importantly grass finished. I hear a lot about organic food and am often sceptical - so in this situation I nodded, bought some mince which was said to be minced in the last hour. On home I went and prepared some thick burgers. My first though? I was shocked by the density of the meat, it felt like deer meat. I ate it rare/blue in the middle and by God was it tasty! Since then, while in the States, I tasted Joel Salitins of Polyface Farm, another who I would recommend as his meat has similar density to the type I adored in Melbourne. Back in Dublin I had a dilemma. I searched for organic meat - tasted a lot, and honestly couldn’t find anything similar. Nothing seemed to have the same density of the wild meat I had tasted in Melbourne or the US. I consulted Beef Gura Niall Davidson of Beef Cartel in London. What Niall told me is that beef is simply not just beef, it comes down to the breading, the environment and the balance of mixed grasses and plants that are in the beasts diet. I attended one of his Beef Cartel events which had great, dense meat, so much tastier and cooked with primal traditional methods. I will go into much more detail in another blog post when I interview Niall. But to summarize, the beef was of the Highlander, bread native to the Scottish Highlands, which foraged for its food in natural environments. My dilemma continued until I found farmer Joe Condon of Omega Beef based in West Waterford. I wanted to ask Joe some questions to get a sense of what he does, so I teamed up with master hunter JJ Devine, and butcher Conor Hammersly who helped me prepare some questions for him. Joe has a herd of primarily Belted Galloways with some Speckle Park cattle. He believes in a system of very low labor farming which allows him to lead his lifestyle and be the one that decides his own hours. For the farmer who always complains about not having time and complains about spending thousands on fertilizer each year Joe is an example of how that does not have to be the norm. Joe has his herd forage for food in common-age land in the Knockmealdown mountain range in West Waterford. The herd cover a vast area of land foraging for their daily nutritional needs. Joe also showed us around his salad bar of mixed greens, which is used to feed his animals in the last few weeks before slaughter. Joe slaughters an animal once every two weeks and ships direct to his customers. He believes in sustainable farming with which he won't put too many animals on the land. He ships in boxes designed specifically for transporting meat to ensure his customers receive the best quality produce. I’ve linked and interview with myself & Joe below. Check it out! I got a box from Joe which I am now only half way through, I can't recommend highly enough. It cooks very different to conventional beef so be sure to research first, as the flavors and density are very comparable to TOMs and Joel Salitins which I would most definitely not say lightly. You can order Joe's produce from his website Omega Beef Direct here, (Ireland Only). I recommend asking for bone marrow to grill on the BBQ, and also use to make amazing stock. And remember …. it’s the health of the soil that reflects the health the food is grown from. Thank you to JJ and Conor for assisting with interview and Joe for being so welcoming to his farm. If you have a product that you think will meet my standards, drop me a mail to discuss a visit.